Grocery shopping has long meant a trek for Boyede Sobitan, ’03 NURS, MHA ’07. In college, it took him about 30 minutes to drive from UIC to Old World Market, an African shop in Chicago’s Uptown neighborhood, to find the foods he grew up eating. 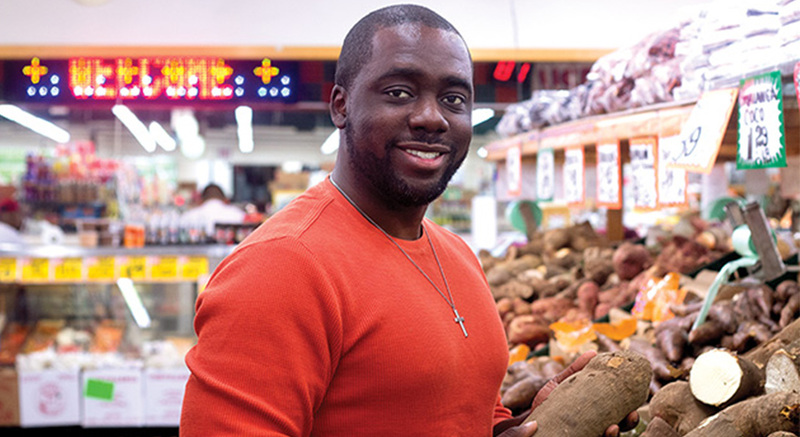 Years later, living in the city’s Bronzeville neighborhood and working in health-care management, Sobitan still had to make a long commute to purchase African staples—that is, until he co-created OjaExpress, an app that facilitates the delivery of African and Caribbean groceries across Chicago. OjaExpress seems like a leap from your health-care background. Even though it’s a little disparate from my background, I think it’s related. [Especially,] when you think about public health and our cultures, with UIC being one of the most culturally diverse schools in the country. And then you think about how many immigrants or second-generation immigrants are forced to change their dietary habits in an effort to conform to the “American lifestyle.” [This service] encourages maintenance of culture, healthy eating and a sense of well-being that I can still have my cultural foods and live in this country. What are some of the most popular items? Goat meat and smoked turkey. We have yams, rice—those are some of the staples. And then we have a couple of specialty brands. We have chin chin—a cookie snack made in West Africa, primarily Nigeria. That’s another positive thing about the app: It allows people who have small companies to get on the app and then have their products distributed throughout the city. We would like to expand to two East Coast cities and to Houston. This is something that we see as not just Chicago-specific. I’m from Chicago, I live in the city, I experienced [the challenge in finding these foods], and I didn’t realize there were so many people who experience the same thing.